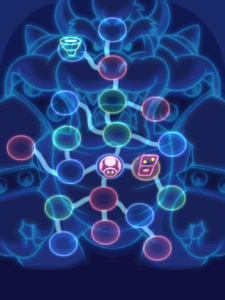 The Flame Pipe is one of the areas inside Bowser's body that appears in Mario & Luigi: Bowser's Inside Story. The Flame Pipe allows Bowser to breathe fire. It is most likely located somewhere in his lungs. When Bowser sees some flimsy material blocking a passage in Cavi Cape, he tries to breathe fire, but he cannot. After a few more attempts at fire breathing, he gives up and is confused by his loss of ability. 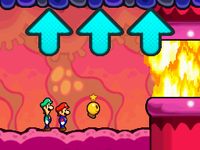 Later in the game, after Mario, Luigi, and Starlow clear Pump Works and exit through a DNA-like door, the Flame Pipe area will be unlocked. The trio encounter a giant Scutlet sitting on top of the bottom part of the pipe. It being there has caused the fire traveling through the pipe to be obstructed, preventing Bowser from using his fire-breathing ability. The giant Scutlet sticks its tongue out at Starlow and pulls her into its body, forcing Mario and Luigi to engage it in battle in order to retrieve Starlow. Upon the Scutlet's defeat, Bowser gains the ability to breathe fire again, allowing him to burn down trees and other flammable objects and to use the shell defense in battle. This page was last edited on December 30, 2018, at 20:50.